Human-wildlife conflict is the term used to describe interactions between wild animals and people that impact either of them negatively. The 'Creating Co-existence' workshop defined human-wildlife conflict like this: “Human-wildlife conflict occurs when the needs and behaviour of wildlife impact negatively on the goals of humans or when the goals of humans negatively impact the needs of wildlife." The photo identification part of the survey always managed to draw huge crowds. We started off interviewing one person and by the time you looked up there was a whole audience around! We got a huge range of answers, depending how close or far the village was from the forest core region. People living in villages far away from the core said the only place they had seen most of these animals was on Discovery! A lot of them called the nilgai "zebra" and the foxes "tiger and giraffe", clear influences from the Serengeti show on Discovery. Not surprisingly, schoolkids were pros at photo identification! People living close to the core, like in one village called Sitaram Pet, carnivores encounters are an everyday occurrence. A lot of times they also said that the "bibat" (leopard) or "patta wallah wagh" (what many villagers call the tiger) attacked their cattle when they're grazing near the forest. Sometimes they, and also jackals and wolves, enter villages to take off easy prey like goats. In Sitaram, we saw a recent kill near the main road, a cow that had fallen prey to a tiger (actually just the bones of the cow remaining!). The tiger usually kept coming back around 7.00 in the evening, the villagers even showed some of us a video of that very tiger marking it's scent on trees nearby, something they do to "draw" their turf! Others said that when they went into the jungle to gather firewood they frequently came face to face with Sloth Bears! The biggest conflict, as the villagers there say, is herbivores polishing off their crops. 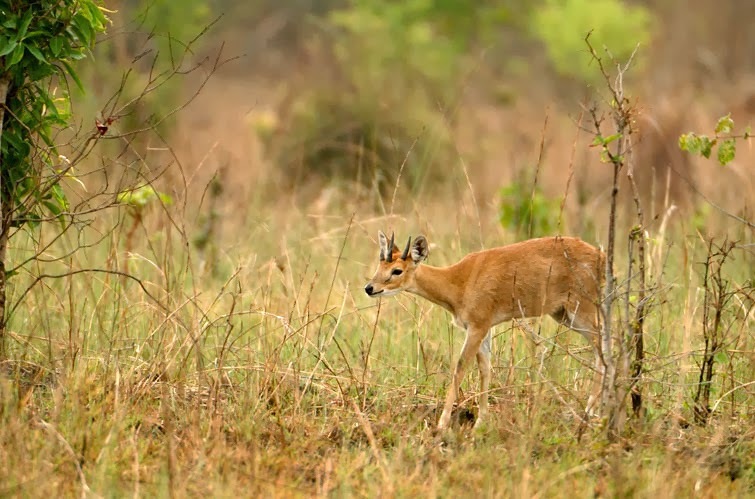 Many of them grow rice, jowar and other crops which are fast food for deer, wild boars and langurs. People are trying to come up with new ways to keep them out. In one field that we passed, we saw a large group of Hanuman langurs munching on newly grown soya bean crops while villagers tried to scare them away by shouting and waving sticks at them. Some langurs on a tree kept deftly dodging the stones being pelted at them! Another time, we were driving back almost at night when we chanced upon a herd of around twenty wild boar (including piglets!) moving stealthily through the bushes. They were probably on their way to the nearest rice field. We were amused by the sighting, but a lot of villagers (who see it everyday) think the wild boar is a pesky nuisance. A lot of people have started fencing their fields to keep the animals out. Or sometimes putting up machans (or watchtowers) in their fields to watch for "raiders" at night. One person told us that the wild boars no longer get scared when they aim torches at them! We asked people to come up with solutions. Some people told us there should be a HUGE wall around the forest so the animals stay inside the forest and don't come out into their fields. The conflict survey made us ask a lot of questions. Are the animals invading the places where these villagers stay? Or did the people get into the place where animals live, since they've been in the forest for probably longer than us? Who's space is it really? This man-animal conflict occurs not only in Tadoba, but all around India, (even in Mumbai!) and we can't exactly say who is in whose space? Conservationists around the country are trying to look for ways that animals and humans can co-exist peacefully before it turns into a turf war. 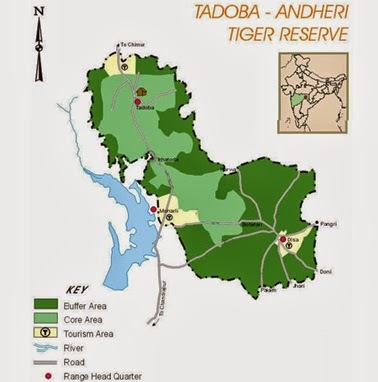 Tadoba Andhari Tiger Reserve (TATR) is also a brilliant place to see wildlife in the monsoons. On our trip there we saw a huge variety of birds, which we usually overlook in national parks. We came across many of Baya weaver nests lining the road when we zipped from village to village to do surveys. 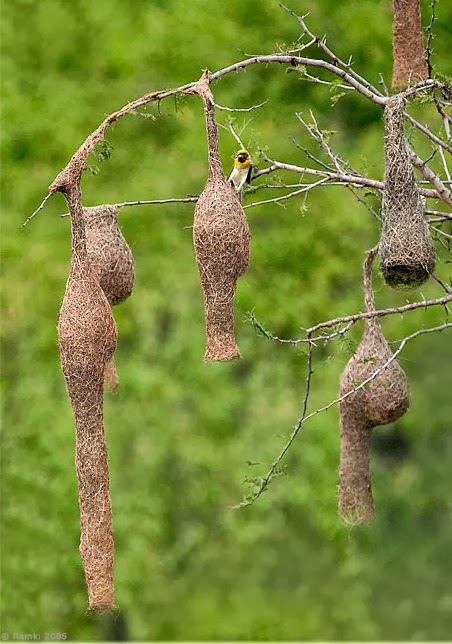 This bird makes around 500 trips over as many as 20 days to gather dried grass for these impressive looking nests! 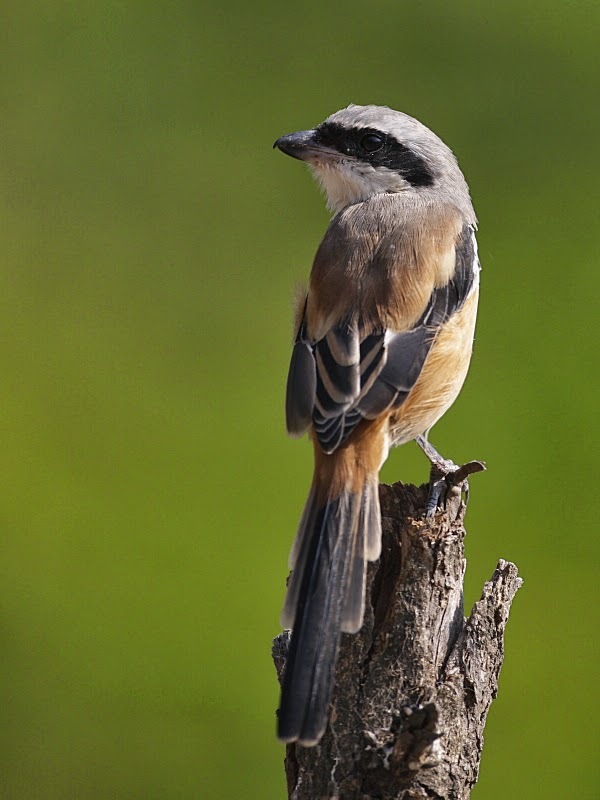 Another bird we frequently saw sitting on electric pole wires along the road was the Long-Tailed Shrike. After getting done with our field work we went for a small safari. Most national parks around India are closed for safaris during the monsoons, there is a just a nine kilometer tar road in TATR open for vehicles doing safris. The erst of the mud roads apparently sink during the monsoons, which makes them off limits. You don't have to look very far to see birds in Gujarat! This makes it one of the best places to hold the Global Bird Watchers' Conference, where people from all over India and the world come to see these winged wonders. We too attended this fourth edition of the Conference and it did prove to be a grand experience! The first thing you see (and hear!) when you step out of the Ahmedabad station is hundreds of noisy Rosy Starlings. These tiny birds that come here for the winter, fly around in huge flocks that look almost like a small tornado; and we all stopped to admire this show of aerial acrobatics. It’s amazing how they fly almost in synchronization, without banging into each other in midair! Even the trees were FULL of Rosy Starlings, and so are the corners of station roofs. Today St. Stanislaus High School, Bandra had its first session with the GreenLine team, making it the newest addition to the Green Schools Campaign. The session was with the 8th Standard boys from the nature club, who were quite a vibrant bunch! There are a lot of different things that we have noticed as the Green Schools Campaign has journeyed out this year. There are schools that are doing a great many number of activities and there are schools that are doing a little lesser, since they are new to the campaign. However, one thing that remains constant, through all the schools that we visit, and all the students that we interact with is the fact that everyone wants to do something, everyone wants to make a positive impact. This phenomenal attitude was seen once again today, at St. Paul's Boys' High School, Dadar. Close to seventy students from the school, all part of the school's Eco-club, attended the first session for the Green Schools Campaign in their school.